In it’s simplest form, a bridge acts as a threshold, connecting two, often times distinctly separate regions. At the site of the Accademia bridge exists just such a condition, where opposing yet complimentary elements collide in their historical and contemporary contexts. The proposed structure for the Accademia bridge infuses and meshes these elements with notable significance. Venice is a city of metamorphosis and transforms with the rising and ebbing tide. It is stone and water, decadent and industrial, traditional and progressive. In Venice, these characteristics do not contradict, but rather reinforce each other. The Accademia bridge serves as the entrance into the city and has the unique honor and obligation to communicate these qualities. The proposed bridge rises from the south bank of the Grand Canal as a solid entity clad in narrow strips of stone. The bridge is elegant and unassuming as it crosses the Grand Canal. Midway, its monolithic cloak begins to disintegrate and reveal the dynamic program inside through layered glass seamlessly supported by the simple frame structure. The café breaks through the solid wall on the north side of the bridge, and the plan room, defined by a glass-clad shell, breaks through the wall on the south side of the project. The bridge transforms from solid to ephemeral, from the permanence of stone into the energy of light and reflection. The Accademia Bridge is comprised of two stone clad walls that hold between them the pathways of the project. The walls provide a datum as one moves across the pedestrian promenade or through the museum corridor. 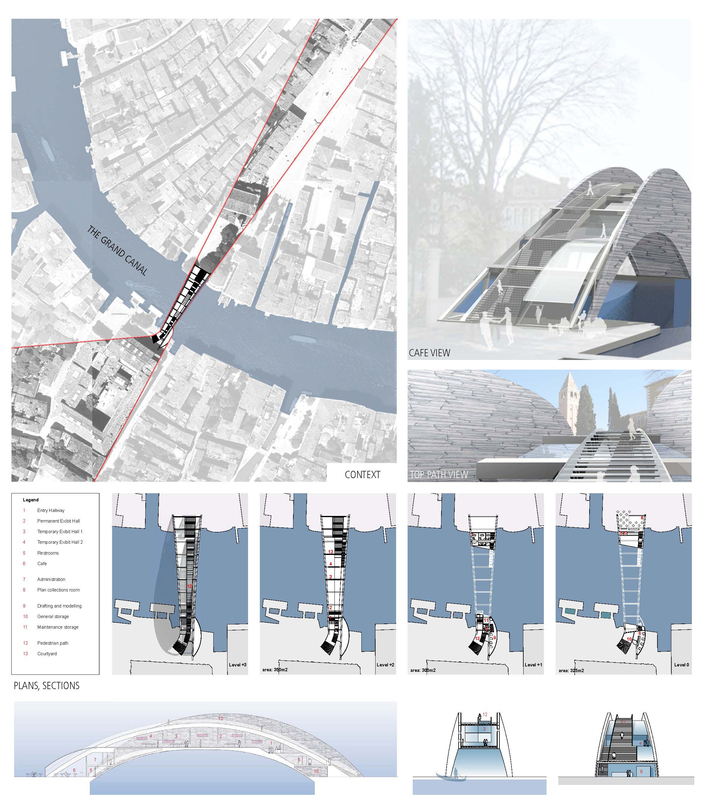 These paths, the essence of the bridge, synthetically combine the circulation, program and enclosure of the project. As one approaches the bridge from the North, a grand staircase engages the piazza, and the café beneath the path of travel freely spills into the square. The pedestrian has several options: one can enter the café and ascend the interior stair up one level into the courtyard above. One can also reach the courtyard via the grand staircase, at which point one can continue up the pedestrian path to the other side or into the museum. On approach from the Academia side, the south bank staircase breaks through the wall to engage the space in front of the Academia. As one climbs this staircase, the south courtyard provides a threshold into the formal entrance of the museum and acts as an observation deck before one continues along the pedestrian path. The pedestrian path arches above the museum and provides its solid enclosure. Continuous skylights of translucent glass flank the path and allow ambient light into the galleries below. People taking this path walk between the grand stone walls, until, midway along the path, they fall back to reveal the city and the Grand Canal on either side. Inside the museum, the collections are linearly arranged so that the museum experience is integrated with the crossing of the bridge. Ambient light filters down the stone walls from the skylights above and illuminate the space, while punctured openings in the walls allow for city views. Through nodes of intersection in the paths of the bridge one has multiple routes from café to museum to outdoor space and finally to either side of the Grand Canal. The bridge visually embodies the essence of Venice. Likewise, the experience of crossing the Accademia Bridge seamlessly blends with the experience of walking through the city. In Venice the path of travel from one place to another has infinite possibilities. Walking in Venice is an event in itself. The proposed bridge has multiple paths of travel as well, so that, like the city, the journey is the destination.